KIEV, Ukraine -- A Ukrainian court on Thursday banned what would have been Ukraine's first-ever gay pride demonstration, upholding a suit by city authorities, who argued the rally would disturb annual Kiev Day celebrations and could spark violence. 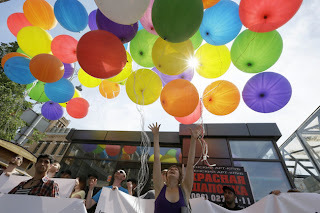 In this May18, 2013 file photo, activists of a gay flash mob throw balloons into the air marking International Day Against Homophobia in Kiev, Ukraine. The ruling dashed the hopes of Ukraine's gay and lesbian community, who planned to use the event to fight discrimination and derogatory stereotypes of gays. Last year, organizers canceled the event at the last minute when skinheads gathered at its planned location, intent on beating up the participants. Still, two leading activists were brutally beaten by radicals in subsequent weeks. Homosexuality was a criminal offense in the USSR and societal resistance to it remains strong two decades later. 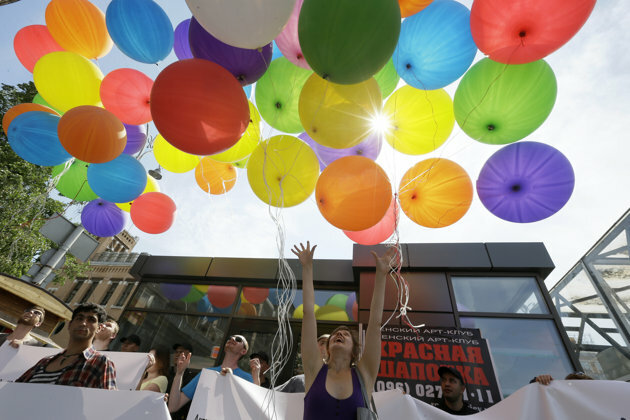 The highly influential Orthodox Church strongly opposes gay rights. A small gay pride rally in the capital of Georgia last week was attacked by a large mob that included Orthodox priests; attempted rallies in Moscow in recent years attract crowds of bellicose Orthodox conservatives. The gay community is now pondering whether to hold the even at a different location, far away from Kiev Day celebrations, or merely hold a press briefly on the banning of the rally. Amnesty International said in a recent report that Ukraine's gay community suffers attacks and abuses and widespread discrimination. Despite condemnation from the West, the Ukrainian parliament is debating several anti-gay bills, including one which would make any public positive depiction of homosexuality punishable by up to five years in prison. Ukraine scored 12 out of 100 points on the so-called Europe rainbow map, a study of gay rights and freedoms conducted by the International Lesbian, Gay, Bisexual, Trans and Intersex Association. By comparison, Britain had 77 points. "There is not enough information about who gays and lesbians really are," said Volodymyr Naumenko, a leading gay rights activist here. "They are people, first of all, they are people who want happiness for themselves." While many Western countries debate and pass laws allowing gay marriage and gay adoption, those notions are still a distant dream for Ukrainian gays. Naumenko said his immediate concern is putting a stop to attacks on gays "and if they do beat you up, let it be prosecuted as a crime based on homophobia." Last year, a local gay-rights advocacy group, cited by Amnesty International, received 29 reports of violent attacks against gays and 36 complaints of threatened violence. Most of these crimes went unresolved, Amnesty said. Last May, the gay pride rally had to be called off at the last minute after scores of thugs had arrived near its planned location looking for trouble — some intent on defending traditional and church values, others with the goal of beating up gays. Even though the event was canceled, a top organizer was chased down by masked youths who kicked him in the head, legs and arms and then stomped on his back. Several weeks later another leading gay activist suffered a broken jaw and a concussion when he was attacked by men shouting homophobic insults. Naumenko, 24, says it took him a while to reveal his sexuality to his friends and parents, but eventually he became tired of having to lie when asked about his plans for a family or having to describe a boyfriend walking next to him as merely a friend, a colleague or a distant cousin. "It's very unpleasant; you lie to the people who are dear to you," Naumenko told The Associated Press at a hotel on the outskirts of Kiev, where he was training organizers of the Saturday rally to maintain order and react to possible violence. Already, anti-gay communities on social media were seeking confrontation and plotting counter rallies and attacks. "How to stop this? Who to write to or call?" asked one member in a posting in one such online group. "Take a hammer and (strike) the skull," replied another. Gay community leaders say that less than 1 percent of Ukraine's gays and lesbians are open about their sexual orientation, while the rest are forced to hide from friends and co-workers and deceive their loved ones. "A situation in which people see you as someone from the Moon or from Mars or from a psychiatric hospital is painful," said Danil Los, a gay 23-year-old medical student who attended Naumenko's seminar.